Make your party unique with these 40 decorations. You can easily fill your party space when you use these 40 shaped cut outs for all of your DIY party ideas. 40 shaped die-cut decor looks great when used as wall decorations, bunting banners, even styled as centerpieces at your tables. Best of all, this set of We Still Do - 40th Wedding Anniversary - Decorations DIY Anniversary Party Essentials, are sure to help you style an impressive party! 40th Wedding Anniversary DIY Party Essential Kit INCLUDES 20 extra-large 40-shaped cut outs - Great for bringing all your DIY anniversary party ideas to life! DIY PARTY SUPPLIES: 40th Wedding Anniversary party essentials include 20 large cut outs in one different 40 shapes that coordinate with the 40th Wedding Anniversary party theme. Set of 20 - 40 shapes SIZE measure 7" x 5. The unique design and large size makes these 40 party decorations an impressive addition to any anniversary party. 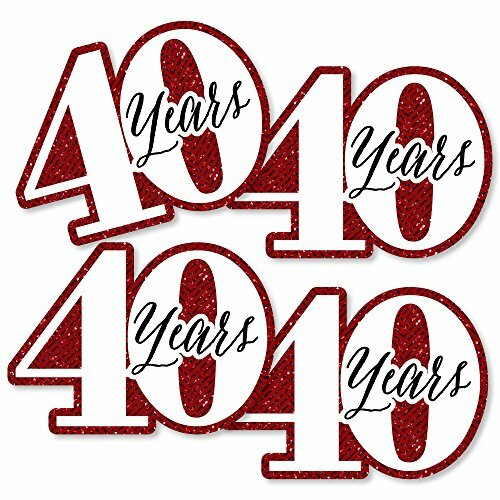 40TH PARTY DECORATIONS: 40th Wedding Anniversary DIY party essentials are printed with art on both sides, so they are perfect for centerpieces or hanging decorations. Hole-punch them and string together as an anniversary party banner, or hang individually as ceiling decorations. 40th Wedding Anniversary large shaped cut outs will make a statement however you choose to use them. HIGH-QUALITY PARTY SUPPLIES: 40th Wedding Anniversary DIY Party essentials are professionally printed on heavy-duty cardstock paper with a photo-like shine. They are individually inspected and carefully packaged by hand. Anniversary party essentials will arrive ready to use in all your creative DIY party ideas! MADE IN THE USA: We Still Do - 40th Wedding Anniversary - Decorations DIY Anniversary Party Essentials are designed and manufactured at our Wisconsin facility using materials that are Made in the USA. 40th Wedding Anniversary party essentials use a No-Mess Glitter Print: Our DIY party supplies are designed with a printed image of glitter, eliminating glitter flake while maximizing bling effect!